Material type: SoundSeries: Scot Harvath.Publisher: [New York] : Simon & Schuster Audio, 2017Edition: Unabridged.Description: 1 online resource (1 sound file (11 hr., 31 min., 07 sec.)) : digital.Content type: spoken word Media type: computer Carrier type: online resourceISBN: 9781508232773; 1508232776.Subject(s): United States. Central Intelligence Agency -- Officials and employees -- Fiction | Harvath, Scot (Fictitious character) -- Fiction | Terrorism -- Prevention -- Fiction | Intelligence officers -- FictionGenre/Form: Audiobooks. | Downloadable audio books.DDC classification: 813/.6 Online resources: Click here to access MontanaLibrary2Go title or place hold | Excerpt Click here to listen to an excerpt of this title Read by Armand Schultz.Summary: INCLUDES A BONUS INTERVIEW WITH THE AUTHOR From #1 New York Times bestselling author Brad Thor.As a storm rages across the Mediterranean Sea, a terrifying distress call is made to the Italian Coast Guard. Days later, a body washes ashore. Identified as a high value terrorism suspect (who had disappeared three years prior), his name sends panic through the Central Intelligence Agency. Where was he headed? What was he planning? And could he be connected to the "spectacular attack" they have been fearing all summer? In a race against time, the CIA taps an unorthodox source to get answers: Navy SEAL turned covert counterterrorism operative, Scot Harvath. Hired on a black contract, Harvath will provide the deniability the United States needs, while he breaks every rule along the way. 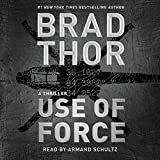 Packed with pulse-pounding action, fascinating characters, and electrifying intrigue, Brad Thor does it again and proves why he is known around-the-world as the "Master of Thrillers." INCLUDES A BONUS INTERVIEW WITH THE AUTHOR From #1 New York Times bestselling author Brad Thor.As a storm rages across the Mediterranean Sea, a terrifying distress call is made to the Italian Coast Guard. Days later, a body washes ashore. Identified as a high value terrorism suspect (who had disappeared three years prior), his name sends panic through the Central Intelligence Agency. Where was he headed? What was he planning? And could he be connected to the "spectacular attack" they have been fearing all summer? In a race against time, the CIA taps an unorthodox source to get answers: Navy SEAL turned covert counterterrorism operative, Scot Harvath. Hired on a black contract, Harvath will provide the deniability the United States needs, while he breaks every rule along the way. Packed with pulse-pounding action, fascinating characters, and electrifying intrigue, Brad Thor does it again and proves why he is known around-the-world as the "Master of Thrillers." Online resource; title from title details screen (OverDrive, viewed July 6).